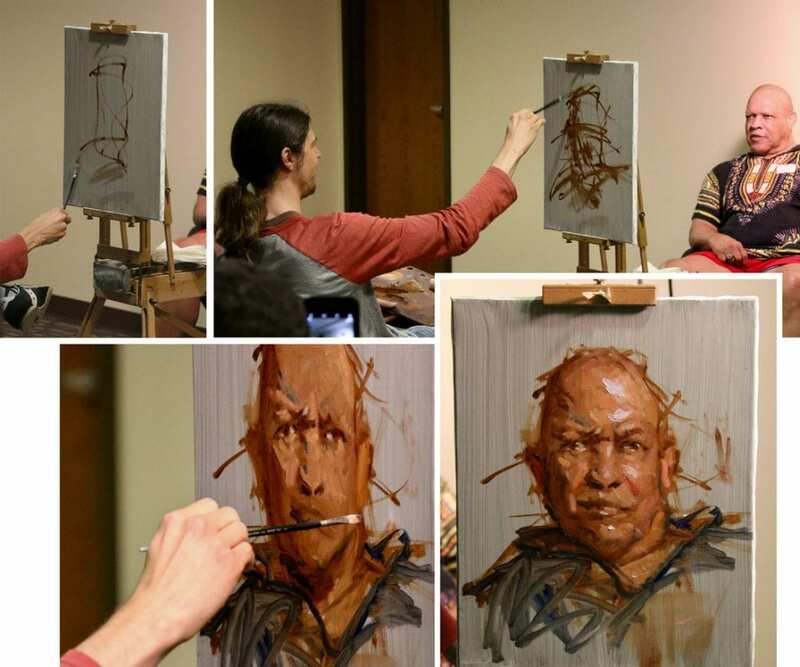 Seth Haverkamp demonstrated his alla prima technique using a life model during the May, 2018 meeting of the Portrait Society of Atlanta. A Best in Show winner at the Portrait Society of America’s International Portrait Competition in 2008, he has won numerous other prestigious awards over the last few years, as well. After receiving a degree in fine art from Carson-Newman College, and attending the Cleveland Institute of Art and Memphis College of Art, Haverkamp studied with Nelson Shanks at Studio Incamminati in Philadelphia. For the demo, he used a gray-toned canvas and quickly began what he termed the “chicken scratch stage” with transparent brown oxide. He immediately struck an energetic rhythm, using rapid, brush-pivoting strokes extending past the form to create a feeling for the basic shape of the head. The speed at which he worked was inspiring—interestingly different from another of his instructors, Robert Liberace, who demonstrates a style of calm and exacting marks. He draws quickly, while explaining that he does not love drawing, and he transitions to painting so he can move things around and jump right into opaque paint. “I want to get some paint everywhere and be able to call it done at any time… all areas are maintained at the same stage,” he stated. “Put a nice rectangle of paint there, then push it around until it becomes the correct shape.” He soon settled into a melodic cadence, moving physically forward to the canvas to see the strokes and then stepping back to view the relationships. He works on features, then flesh, then clothing—on the form and off the form, while identifying shapes and negative shapes to create the illusion of three-dimensional flesh and bone. “I am experimenting with form and colors in an almost abstract way. I’m trying stuff and seeing what will work, taking it out if it doesn’t work,” he said. This made sense to the audience as he talked about his style as expressive realism and about his backgrounds, inspired by the paintings of Gustav Klimt. He captures the energy of a subject, an impression rather than a “rendered glorious painting.” He lets the paint do the work. 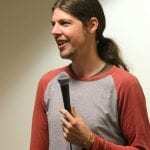 During a period of discussion with the audience, the model, Harvey Clanton, reacted slightly, making a facial expression that Seth noticed and asked him to repeat. It was the uplifting of one eyebrow which added a much stronger emotional dynamic to the personality of the painting. 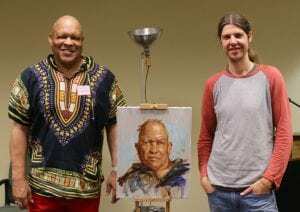 Harvey Clanton and Seth Haverkamp with the finished portrait. Haverkamp developed his interesting background style because he absolutely hates to paint them. Once, while working on a painting of his wife, he was happy with the portrait but felt the background was unsuccessful and ruined the piece. In frustration, he laid the canvas flat on the ground and threw color onto it. The next day, he discovered that he liked the resulting watercolor-like effect of varied colors—so he developed a method of producing the effect intentionally.